Muffins can solve many problems: a hungry house full of weekend guests, a last minute snack for preschool, quick and easy breakfasts through the week (from the freezer), or as I recently found myself, with double my usual number of hungry children running underfoot. While not all muffins hold well enough to serve after they have been left to cool, these muffins are still moist and flavorful hours after they have cooled or even reheated from the freezer. 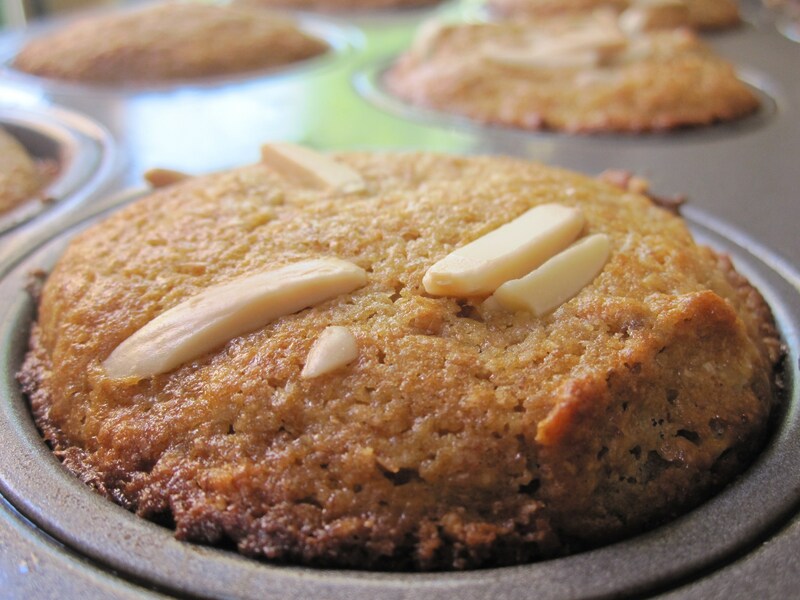 Apricot Almond Bran Muffins are adapted from a recipe in Supernatural Everyday by Heidi Swanson that I have come to love. If you are seeking a super dense. chewy style of bran muffing, this is not the one. Though this recipe is whole grain with a healthy dose of bran, the texture is incredibly light and tender. The taste of butter is unmistakable. I added apricots to take advantage of the beautiful fruit found at the market. 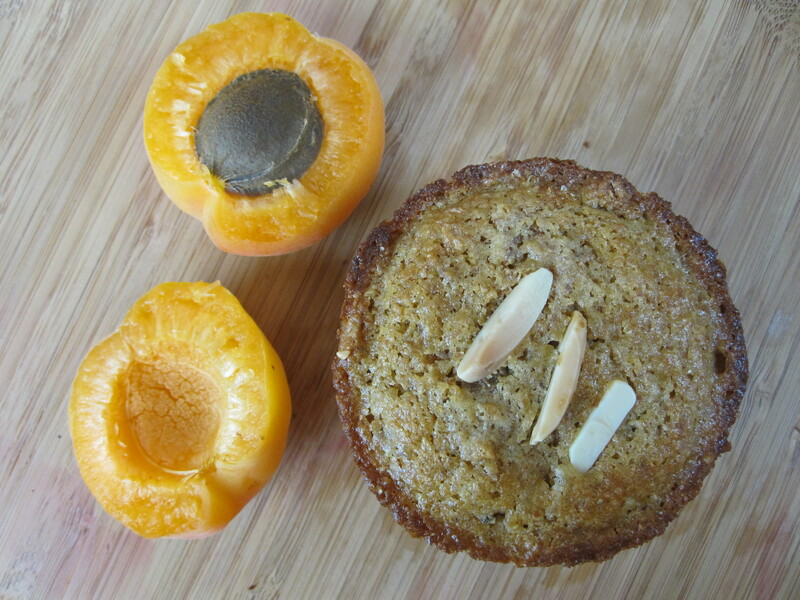 Almonds, always a friend of the apricot, flavor the muffin and add a crunch to the top. Make these for a crowd, or just for a few and freeze the rest. They reheat beautifully. Preheat your oven to 400 degrees. Generously butter a 12 cup muffin pan. In a medium-sized bowl, mix together the eggs, buttermilk or yogurt, butter, maple syrup, and almond extract. Add the bran and flakes and mix. Set aside. In a large bowl, whisk together the whole wheat flour, brown sugar, baking soda, baking powder and salt. Pour the liquid mixture into the dry mixture and fold until just combined. Fold in the apricots. Scoop the muffin batter evenly into the twelve muffin cups. Scatter a few almond pieces on each muffin. Bake for 18-22 minutes or until the tops are golden and a toothpick inserted into the center of a muffin comes out clean. Cool for 5 minutes, then gently slide a knife around each muffin. Serve immediately or transfer muffins to a cooling rack. Thanks Sara! The book is full of wholesome inspiration, definitely worth adding to your library. These sound heavenly. You are right – almonds and apricots go hand in hand. Mmm, a light and tender bran muffin sounds scrumptious, and I’m loving the apricots right now. Thank you for sharing – I’ll be making these soon! Sounds delicious. Thanks for sharing, Denise.